Okay, I am in love with chopped salads. I have dabbled before, but this time I’ve fallen hard. These are the salads for people who don’t think salads are hearty enough to be the centerpiece of the meal (a.k.a. the former me). 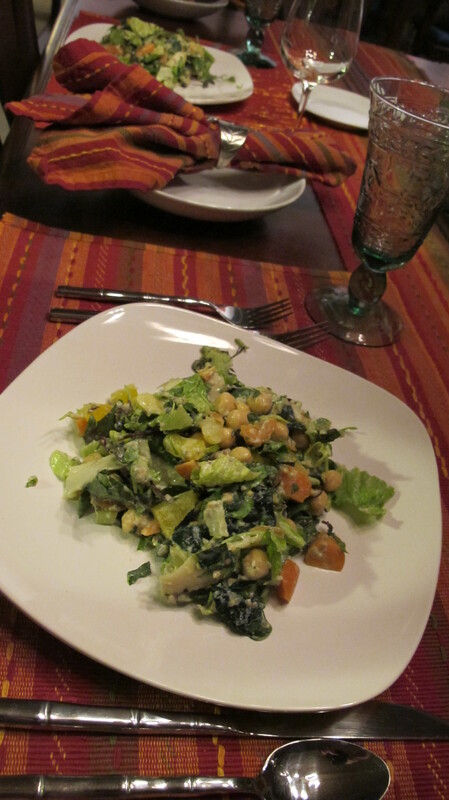 These are salads that seem gourmet and take minutes, miraculously transform your leftovers and make your life easier. They might even pay your bills if you let them. You need a few simple tools: a large tree stump (or a v. big cutting board); a sharp knife and a pancake turner. I will provide you with my very favorite and oft-requested dressing recipe, the technique and some suggestions to set the salad artiste in you free. You must go boldly beyond and send me photographs for my facebook page (stirthepotgr…of course). Fun add-ins, to include: sunflower seeds, shelled pistachios, hearts of palm, tart apple, jicama, leftover grains or vegetables or beans or seeds or nuts–nothing too mushy. Use your imagination! 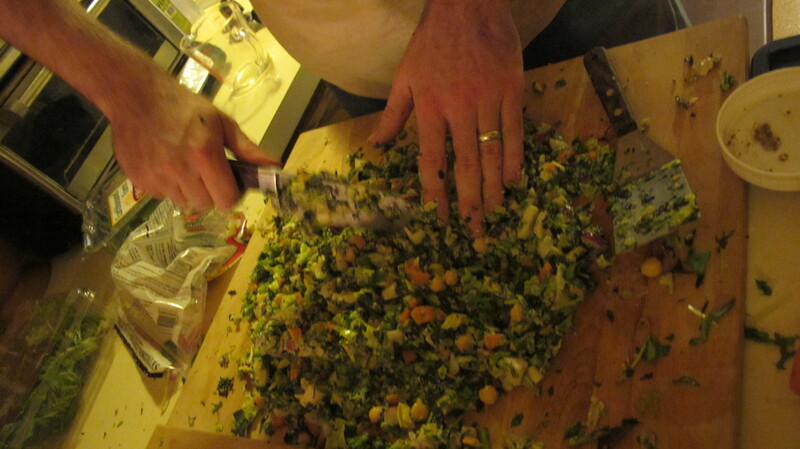 Using the biggest cutting board surface you can find, begin chopping the greens and vegetables together. Continue to toss the ingredients from the outer edges into the center. Your goal is to fully incorporate the ingredients and chop the vegetables into small pieces. But not to make a mash! 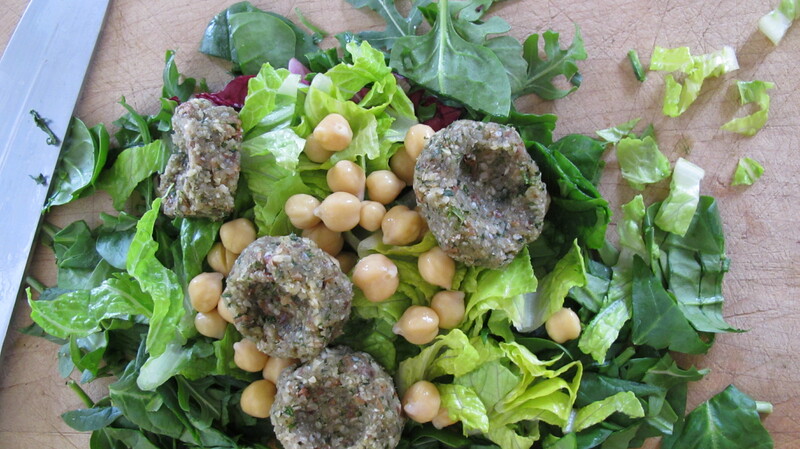 After a few minutes, add blobs of dressing onto your pile and begin to incorporate. 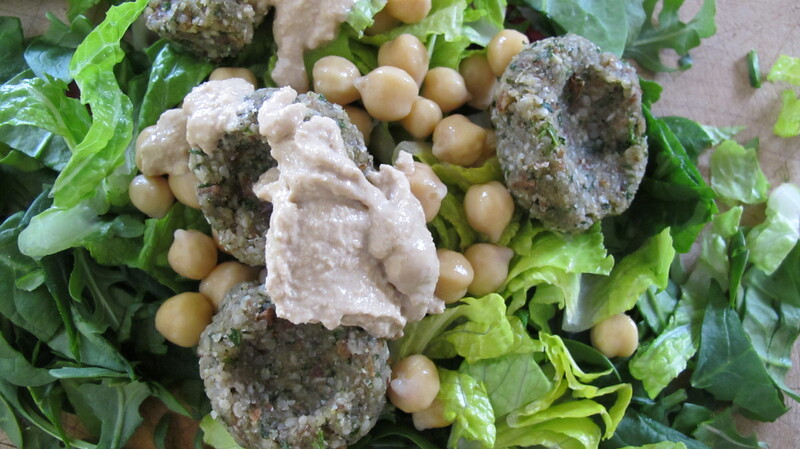 Add the chickpeas and other add-ins. 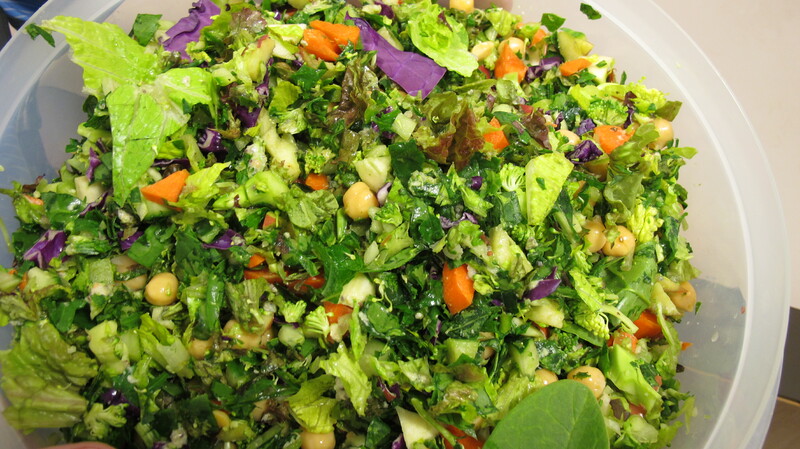 Keep chopping and rearranging until your salad is of uniform consistency. There’s something about all this chopping that gets the men to volunteer. 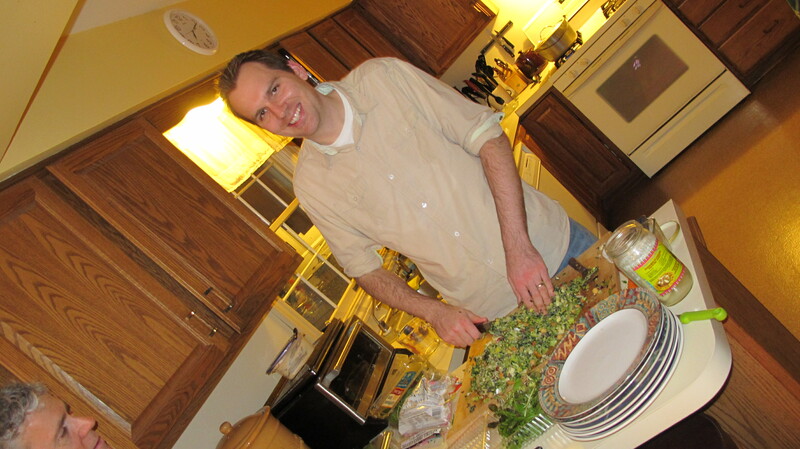 Here, Brian Doane demonstrates technique at a recent dinner party. Curdle the soymilk by combining with the lemon juice. Let rest for about five minutes. Mix in the rest of the ingredients. Let rest another five minutes to meld and thicken. Best to put this in a jelly jar and shake it until your arm starts to vibrate on its own–this will ensure that the almond meal is fully incorporated. it will really thicken if you can put it in the fridge for a half hour or so. 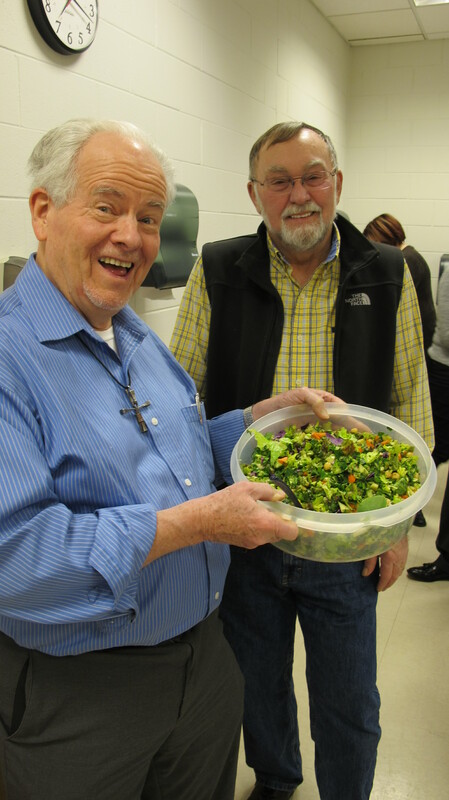 At a recent cooking class, Joe and Gary took over and were very proud of their results. Sadly, we didn’t have enough dressing for this 24 person salad. That is a shame, because it’s just not good without a lot of delicious dressing…and the dressing doesn’t have to be caloric, either. Don’t forget the dressing (and plenty of it). Two minutes later… I call it lunch. I can attest that this is a delicious salad! Thanks for the recipe Sue! 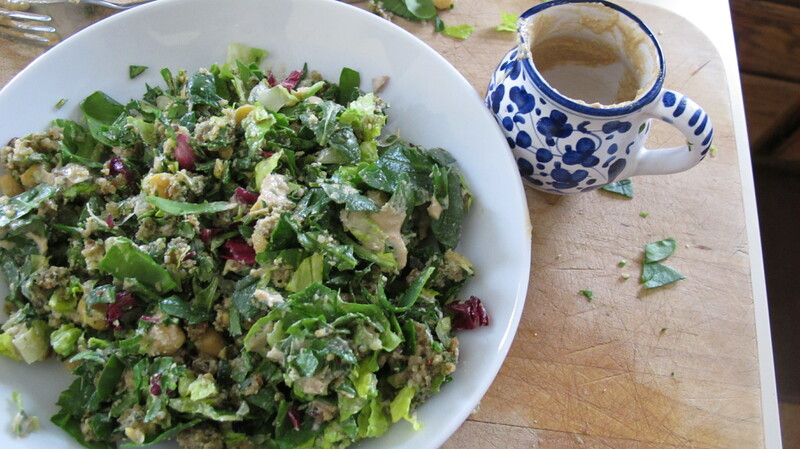 I made this dressing and doubled it and ate it all week on everything. It was great.